Celtic v Rangers: How does Neil Lennon's Old Firm record compare? 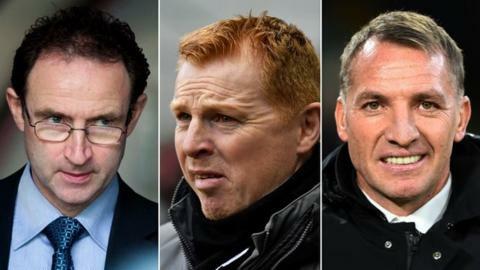 How does Lennon's Old Firm record compare with other Celtic managers? Neil Lennon won three league titles and two Scottish Cups during his first stint as Celtic manager, but how does he fare in the currency of Old Firm success? The Northern Irishman will take charge of the Scottish Premiership leaders on Sunday in his first derby since April 2012. A win would move his side 13 points clear with seven games to play and, on a personal level, might just edge him towards a permanent appointment as Celtic boss. But how does his Old Firm record compare with those who preceded and succeeded him as Celtic manager over the last 19 years? Lennon's win ratio against Rangers is the joint third best record among Celtic's last six managers, with six wins and two draws in his 12 Old Firm matches. Only Brendan Rodgers at a remarkable 77% and Martin O'Neill - whose teams Lennon played in - at 59% have fared better. The current Parkhead boss's win ratio of 50% is the same as that of successor Ronny Deila, although that comes with the significant caveat that the Norwegian only presided over two Old Firm games and both came in cup competitions against a Rangers side playing in the Championship. When you dig down deeper into the numbers and look at the points per Old Firm game won by Celtic's last six bosses - assigning the standard league rewards to cup matches - Lennon's record is burnished further. Rodgers, unsurprisingly, stands a distance above the rest but Lennon's average of 1.7 is only just short of that of the feted O'Neill on 1.89 and is 0.3 points per game better than Gordon Strachan, Deila and Tony Mowbray. Rodgers' all-conquering side again come out on top when it comes to average goals scored (2.4) and conceded (0.5) in Old Firm matches, but Lennon again holds his own by that measure. Although Deila's Celtic scored four times in his two matches to leave him - perhaps disingenuously - with the second-best record, Lennon's stats of 1.7 goals per game puts him on a par with O'Neill and far beyond Mowbray and Strachan. Where Lennon does falter is in his side's defensive record, which sits last alongside Mowbray's with an average of 1.3 goals conceded per game. However, once again, that is by no means a notable drop off from O'Neill and Strachan's records of 1.26 and 1.13 respectively.